Like most kids heading into seventh grade, Jesús Cortés-Sanchez was not yet thinking ahead to a future career. What mattered most then was enjoying time with his friends. Even into his high school years, the idea of going to college was not on his mind. An undocumented student ineligible to apply for federal student aid, he viewed college as an unrealistic, financially impossible feat. 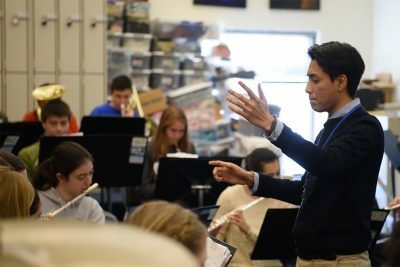 All of that would start to change when a recent Yale School of Music graduate named John Miller began recruiting students to a new band program he had established at Cortés-Sanchez’s middle school in New Haven, Conn.
His decision to sign up for band would ultimately change the direction of his life. Thanks to a grant secured by Miller, each student in band received a musical instrument. For Cortés-Sanchez, that instrument was a clarinet. Before long, spending time with his friends would lead him to discover a profound love for music — from classical and jazz to cultural mariachi and cumbia. 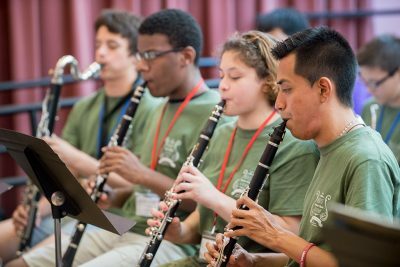 When summer arrived, Miller persuaded Cortés-Sanchez to join Yale’s Morse Summer Music Academy, an all-day music camp he had created, with contributions from Yale’s Class of 1957, for New Haven public school students unable to afford private music instruction. Cortés-Sanchez and his bandmates later went on to attend a local magnet arts high school, where Miller knew the budding musicians would be playing music every day. Cortés-Sanchez interns as a music teacher at William Hall High School in West Hartford, Conn.
“Throughout high school, and because of Morse [Academy], I was getting all of these wonderful opportunities to play with orchestra, to do competitions,” Cortés-Sanchez says. Miller continued to assist, securing Cortés-Sanchez’s entry into New Haven’s Neighborhood Music School, a community arts organization where he received free lessons and performed in various ensembles during the school year, and encouraging him and his bandmates to pursue even loftier goals. As the time to apply for college loomed, Miller’s advice stuck with Cortés-Sanchez even as paying for school posed an enormous challenge. However, the many teachers and mentors Cortés-Sanchez had met through the magnet school, summers at Morse Academy, and his other music activities were not ready to give up. They encouraged him to try for scholarships and volunteered to assist him with the application process. Cortés-Sanchez is well on his way to fulfilling Miller’s hope for him. Having completed his bachelor’s degree this past spring through the Neag School’s Integrated Bachelor’s/Master’s (IB/M) program, he is on track to finish his master’s degree with a concentration in music education come May. Scholarship support has made his college career possible. In fact, without his most recent award — a gift established at the Neag School by UConn alumni Carla Klein ’72 (ED) and her late husband, John ’71 (CLAS), ’77 JD — Cortés-Sanchez admits he may not have been able to complete his final year in the program. “There a lot of students in my position who are really passionate about something, but unfortunately don’t get the opportunity. This means the world to me. 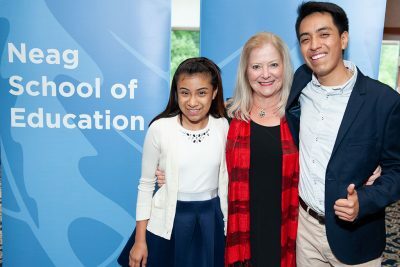 This is not just a scholarship for me; it’s a scholarship for my family,” says Cortés-Sanchez who this fall will be one of two inaugural recipients of the John and Carla Klein Endowment for Graduate Assistants in Teacher Education. Carla Klein, a retired schoolteacher, has dedicated herself to supporting numerous educational endeavors through scholarships and service over the years. She and John, former president and CEO of People’s United Bank who died of esophageal cancer in 2008, had been active in raising awareness and funding for various education causes, including support for school programs across the state focused on anti-bullying. A member of the Bridgeport Public Education Fund board of directors, she also was previously co-chair of Operation Respect Connecticut and spent a year serving on the Connecticut Commission on Educational Achievement, making recommendations — many of which were ultimately adopted by Gov. Dannel Malloy — on issues related to closing the achievement gap. Funding these graduate assistantships is just one example of the Kleins’ extensive history of philanthropic giving in the education realm, which continues today. At UConn, the Kleins have supported Neag School professorships and student scholarships as well as athletics, business, and law school efforts, in addition to a range of other causes nationwide, many of them education- and research-related. Her adult children, Eric and Kristen, have since become part of the family tradition of giving as well. Most recently, the Klein Family Foundation — run by Carla Klein, along with her children — has instituted the Klein Family Scholarship Fund at the Neag School. The $250,000 gift, which will go into effect in Fall 2019, will provide financial support to several teacher education students with demonstrated financial need and academic achievement. Music, as it turned out, was just what Cortés-Sanchez needed to achieve that balance in his life, to secure a sense of hope and stability for his future. Music not only provided an outlet; it gave him, he has come to realize, much more than that. “I love the skills that I learned through music,” he says. “Through music, I learned how to work collaboratively with a group of friends. I got the opportunity to do public speaking, and to really take something and look at it and focus on it for a long time, which really helped me in other academic areas. There were these small, essential skills that I didn’t value until I got to college. Then I saw how all these things are connected. Cortés-Sanchez also is quick to credit his teachers and mentors — from the late John Miller to his high school teachers Rachel Antonucci and Patrick Smith; Yale School of Music Assistant Dean Michael Yaffe and Morse Academy director Ruben Rodriguez; and Hall High music teacher James Antonucci — with inspiring him. “They are great leaders I look up to and am so grateful to have in my life,” he says. As Cortés-Sanchez completes his graduate degree, his focus remains on returning to New Haven, to teach children and give back to the community that offered him so much support. Interested in supporting a Neag School student scholarship? Learn more here. To help provide musical instruments for deserving instrumental performers from New Haven Public Schools just like Jesus Cortes-Sanchez, make a donation to the John Miller Instrument Fund for New Haven Public Schools, Office of the Dean, Yale School of Music, PO Box 208246, New Haven, CT 06520-8246.